Goldilocks wants to set the record straight. No doubt you’ve heard about the time she was charged with break and enter, damaging goods and terrorising bears. The story currently circulating is nothing more than a jumble of half-truths and distorted rumour. Mrs Bear wanted to spruce up her home in preparation for the visit of her in-laws. The old home was looking a bit tired and rundown and Mrs Bear hadn’t had time to do it herself due to a long hibernation. So she hired an interior decorator, Goldie of Goldie’s Golden Homes, who promised her a golden result. However, Mrs Bear was concerned about Mr Bear’s reaction, both to a suddenly golden cottage as well as the financial cost. She decided the best way to proceed was to present him with a fait accompli, so she took Mr Bear for a long walk. Once they’d left Goldie let herself in and set to work. All went well, bar a slight accident or two, until Mr Bear arrived back unexpectedly just as Goldie was lying down to check the new mattress she’d bought to help Mr Bear’s bad neck. 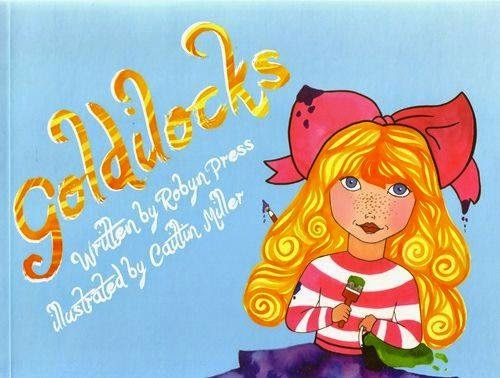 Goldie proclaims her innocence in rhyme all the way through this flamboyantly illustrated picture book, splashed throughout with bright yellow gold. Hi, they call me Goldilocks; you’ve likely heard my name. I’ve been inside a fairytale, that’s where I found my fame.